Need a simple side dish that's quick and versatile? 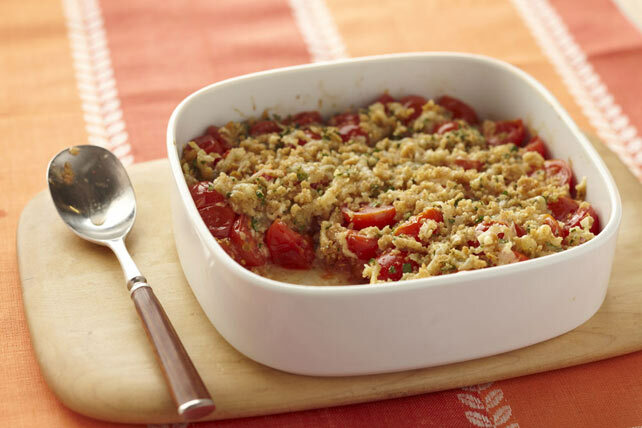 Cherry tomatoes are topped with a cheesy crumb topping and oven-baked to perfection - this veggie side dish is the ideal accompaniment to grilled meat, baked chicken or steamed fish. Toss tomatoes with dressing in 8-inch square baking dish. Combine next 4 ingredients. Add margarine; mix well. Sprinkle over tomatoes. For added colour, prepare using heirloom varieties of cherry tomatoes, such as yellow and orange. The word "betty" dates back to colonial America and refers to baked puddings, either sweet or savoury, topped with buttered bread crumbs. Enjoy our contemporary twist on a traditional "betty." As a bonus, it can be part of a healthful eating plan.